One of my passions in transport is helping the younger generation venture forth independently into their city. Sometimes the ways we (and AT) can help them are obvious – smiling so they feel comfortable to ask questions, making sure there’s really good wayfinding information and safe crossing infrastructure, having a logical, intuitive network, training the drivers to treat young people as customers who are at least as important as others. The Outer Link was a step up in network connectivity, because it provided 15 minute frequency to parts of Auckland that had never experienced this before. It is also a great bus for people who don’t use the bus much – the “Link” brand and special colours is for routes that connect important locations for visitors from other parts of Auckland or outside Auckland, and the Outer Link does this well; if you like the simplicity of the colour branding, aren’t too concerned about how long it takes, and you’ve become used to its meandering route, it’s great. However, the network has moved on now, to a higher level of connectivity, and the Outer Link does suffer with several downsides stemming from its “loop” nature. Some of these problems affect people who use the buses a lot and want efficiency, and some of them affect brand new users. 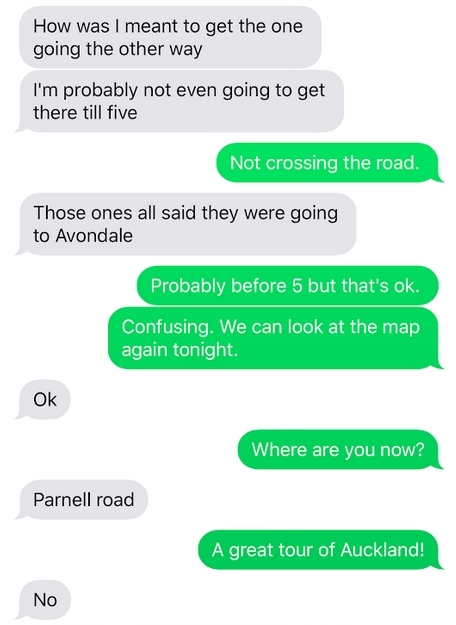 Here is a text exchange between a friend of mine and her young daughter, who was trying to get from Mt Albert to Ponsonby on the Outer Link. It was a journey she hadn’t taken before. The shape of the route means that you are often facing opposite to where you want to go, so new users can quickly worry if they’ve taken the bus in the right direction. And sometimes they haven’t. The lack of logic in trying to go to Herne Bay by heading south along Dominion Rd, to Parnell by heading south along Mt Eden Rd, or to Ponsonby by heading southwest along New North Rd, can play havoc with decision-making, leading to new users sometimes discarding good advice. If you do end up going around the wrong way, the instructions you may have been given for where to get off, using visual cues as you approach, no longer work. In this case, approaching Three Lamps from College Hill looks very different to approaching it from Jervois Rd. In circle geometry, a curving arc is longer than a straight chord. But the Outer Link’s route is even less direct than a circle. The dogleg in Mt Eden adds a lot of extra (often congested) mileage, leading to loss of time reliability, bunched buses and frustrated passengers. The proposed replacement routes will be more direct for users. Of course there’s always someone for whom even a very indirect bus connects them door to door, but in general, straight lines serve the network better. Until the network can be ironed out, and the Outer Link replaced with a better set of direct frequent routes, I wonder if drivers can do more to explain to passengers what’s happening? Some of the drivers go out of their way to do so, but it’s a bit hit and miss. If this girl hadn’t had her mother at the other end of a phone, would she have received reassurance from a driver or a smiling stranger? Having not had to rely on the Outer Link I can’t comment, but if I have one great thing to say about the Link buses, it’s their bright colour schemes make their respective routes instantly recognisable. And I assume the dour blue and silver for every other bus is purely down to the side effect of the PTOM and it’s mindless competitive script to ensure easy transition for contract turnovers, which makes every other service less than easy to pick out short of the destination signs. You are spot on about the way young people are treated, almost with distain. They’re easy targets who won’t bite back. It’s not just PT however, it’s adults and their default bully personalities coming to the fore, unfortunately! One of the effects of the Supergold Card has been to increase the presence of more time-rich, often calmer, over-65’s, even outside the free hours, as I think they are simply using the buses more. Recently I’ve noticed the positive social outcomes from this; older people are often willing to provide a supervisory, informative or comforting role. It reminded me of places like Japan where I understand the elderly volunteer to supervise safe passage for the school children. Sometimes positive change comes in unexpected ways. There is a scientific reason they decided on dark blue and grey for the buses. It is the best urban camouflage so they don’t have to stop at every bus stop. It is particularly effective at night. True story. This difference in visibility is very obvious for Birkenhead buses. AT employed expensive branding consultants. The breif was that that AT wanted something different and to reflect their culture. The consultants delivered, and it was adopted. This is why the transport planners and managers need to actually take the trains/buses/ferries. I don’t mean to get to/from work, I mean actually test out the results of their decisions for themselves – Preferably with somebody who doesn’t work in their profession. It’s also another communication failure for AT, which begs the question: How come AT is so crap at communication? +1 Also to include on and off peak time, as I believe that there are different issues at different times of the day. I think AT should send their PT team to regularly experience the system at different times and then gives some feedback. Ideally also send the senior decision makers to overseas to experience the leading cities with best PT systems. Not all adults are bullies. There is lots of latent kindness and I think it would be helpful to everyone to shift the stranger danger mindset into a it is a ghost thing to look out for each other one. Lovely post Heidi. I like link buses but very much agree that drivers or AT could make sure their customers are going the right way. The link buses have screens don’t they? Why not show their progress around the route? Thanks Alex. One problem I’ve noticed is that more and more of the screens aren’t working. Better still – Why not strive to have projected bus routes or upcoming stops on the side of buses via a map projected onto a screen before you tag on? What month will Auckland transport remove the Outerlink,is it Jan 2019? 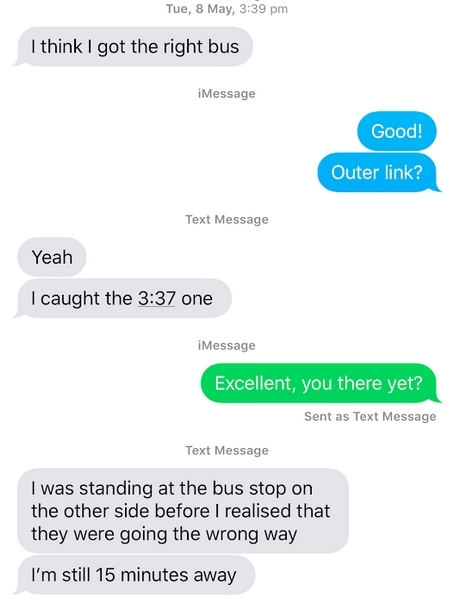 I have similar kinds of concerns about the Inner Link, where friends STILL tell me from time to time that they accidentally got on the bus going in the wrong direction. It’s not so bad now the dogleg into the city has been removed, but still . . . The solution is surely obvious. Come September there will be the “new” 866 (actually the current 962 in drag, beefed up, but not enough to call it the originally-proposed NX3). The 866 will exactly duplicate the Inner Link all the way from Three Lamps to Newmarket – surely that’s not necessary, wasteful, even. If the Inner Link heading to Newmarket via Ponsonby were to terminate at Great North Road (or the Vinegar Lane development) then all bases would still be covered for Ponsonby users heading to the city. There’d be a saving of bus capacity from the Inner Link which could then be applied to the new 866 to bring it up to Frequent status (and allow it to be renamed the NX3 – noting that it’s currently proposed to be Mo-Fri daytime only). Not only would this “solve” the Inner Link problem by removing its circularity, but it would also provide a full time “frequent” service from Ponsonby, the Hospital and Newmarket to the North Shore. It would also solve the problem of the confusion that I see so regularly when I use the stop on Broadway at the foot of Khyber Pass, heading toward K Road. I see upset and even angry potential passengers trying to wave down Parnell-heading buses, not understanding that the Link bifurcates at that point, and that only one branch uses that stop. New users and visitors are particularly vulnerable – but even after using it for 21 years myself, I still get caught out myself from time to time trying to flag down the wrong bus. Its no better at the other end of Broadway where both directions share the same stop. Mandatory questions every time an Inner Link bus arrives are “where are you going next?” followed by “how long are you going to idle here before you leave?” with the Outer attracting the latter question as well. Also, the website map gives no clue where the stop actually is. I eventually found a green bus outside 277 on Google maps! My friend from Christchurch wanted to go to Victoria Park, so I said make sure it’s going via Parnell, not Ponsonby. Three buses in a row went to Ponsonby, except one was labelled Parnell but changed just as she was about to board. Being resourceful she eventually sussed it out. Not a good look for a visitor. Inner link has the worst reliability. There was a case I waited for almost one hour and still no bus, the bus that supposed to arrive in the real-time board just disappeared. It was very frustrating and make me late. I don’t catch busses all that much so when I do I’m often going somewhere I’ve never been before or haven’t been along in some months. Now I happen to think that I’m quite good at reading maps and using journey planner but if you’re not going to a major stop (read: train station usually) it’s very unclear where you’re meant to hop off. A lot of bus stops are, for sake of argument, described as being at say 234 Remuera Road. Okay, that’s great. Have you noticed how many streets in Auckland don’t have street signs? How many houses have barely (if at all) visible numbers? For a long time I thought this was just something we’d have to live with but then I went on holiday to London and spent most of my time on busses. And you know what their busses do/have? A stop announcer like our trains. This makes things so much easier. More bus stops are getting signs with names on them now, too. 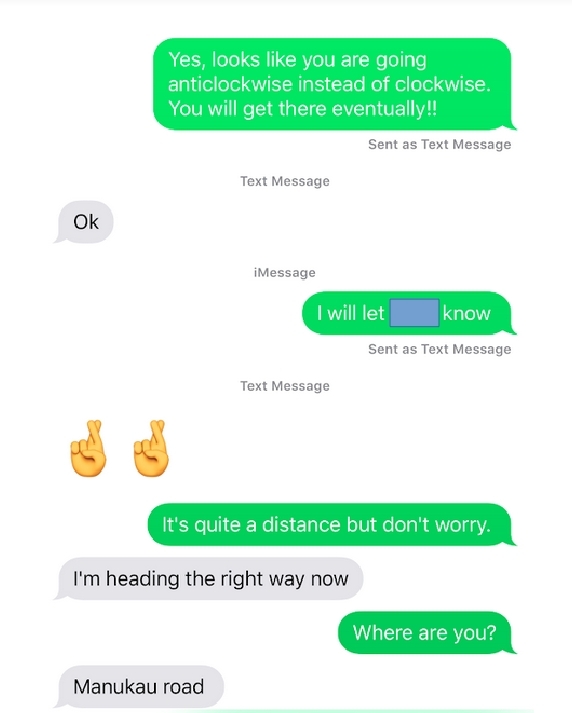 They’ve impressed my younger son, who is out and about by himself now and appreciates the confirmation he gets when he sees them. The AT Hop app will tell you your stop is approaching, but I agree stop announcements would be good. Especially if they also referenced way finding landmarks and likely destinations, e.g. “The next stop is 234 Remuera Road. Alight here for Remuera Primary School.” If you miss hearing (or have forgotten) the road number, you’re more likely to hear and remember that you want the Remuera Primary School stop. Belt and braces is the best approach. Yes, apps are useful for some people, and yes, plenty of people don’t have smart phones (that goes for me and my family, for example, but everybody can be in that position if something goes wrong with phone, battery or connection). Friendly strangers with phones often help out people without phones, I’ve observed. Looking out the window is great, but doesn’t work if you’re going somewhere you don’t know. Asking the driver is good for combating loneliness, but scary for some, especially since it is frowned upon to hold up the bus. Gillian’s idea of stop announcements is a good idea, as is Whirsler’s idea of more street signs, plus larger and more street numbers on letter boxes and shops would be good. The dynamic map and/or upcoming stops on the side of the bus and on a screen inside makes sense, as do the bus stops with name signs. Basically, if we’re designing a system for real people, in different states of familiarity with the area and network, and different levels of confidence and competency, we’ll put money into making it as user-friendly as possible. Thanks for the suggestion Missing Link. It looks impressive – I’ll try it next time I get to use public transport. The big problem is there is no way to find where are the minor bus stops. The map doesn’t show it, neither the timetable, not in the bus either. If I am a casual user, how the hell can I know when do I get off? This again demonstrates the people who design this never use it themselves. The thing is, I think the people who design it do use the system. It’s the people who prevent a proper budget being set up for wayfinding who probably don’t. Can we get the new CEO to tell those guys to increase the wayfinding budget? I imagine he’d be open to it. We can certainly ask him, and also write a post about the extent of changes required. I’m not sure? I remember once catching a bus where I was directed to hop off by Journey Planner on what amounted to… well, nothing. I don’t think there was a shelter on the other side of the road either. There was me, a slight grassy slope and I guess the bus stop pole but that was it. I know it was the right place to go because Journey Planner is really good at providing a map so it was possible to see what roads we were going past and hence after which one I should push the button. It might be possible that you’ve seen bus drivers dropping regular passengers off closer to their destination than the official bus stop. 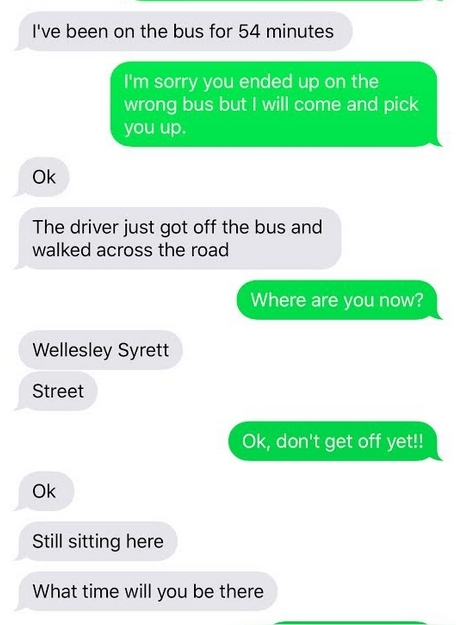 One of the first couple of times I caught the only bus I ever used to catch regularly featured this behaviour and it was confusing (plus a little annoying… I was noticeably closer to the official stop). The inner link has the be the worst for heading in the wrong direction. It is frustrating that both services head the same way past Newmarket but it is a gamble if you catch the one to Ponsoby or Parnell. The Outer Link is one of the most successful bus routes, over 215,000 passengers per month, similar to the Inner Link. Why you’d want to ruin this beats me. 215,000 passengers wouldn’t catch it each month if it was as crap as you make it out to be. Let’s hope AT don’t use the same consultants Greater Wellington council used to massively ruin their bus network!!! The three main lines on the rail network each had over 215,000 trips per month before we introduced electric trains. They now have about 600,000 each. The diesel trains were crap and some people still found them useful. The Outer Link is crap and some people still find it useful. 215,000 passengers a month on a route that links place that significant is crap. Lets fix the Outer Link and get some decent ridership on it. We used to use the Outer Link a lot. However, for us the new Route 20 will take us to 3 Lamps from Kingsland much faster, and the Route 66 bus will take us to Pt Chev north of Meola much more efficiently. All we need is a Kingsland to Newmarket bus and we won’t need it at all. (And yes, I know we can get the train). 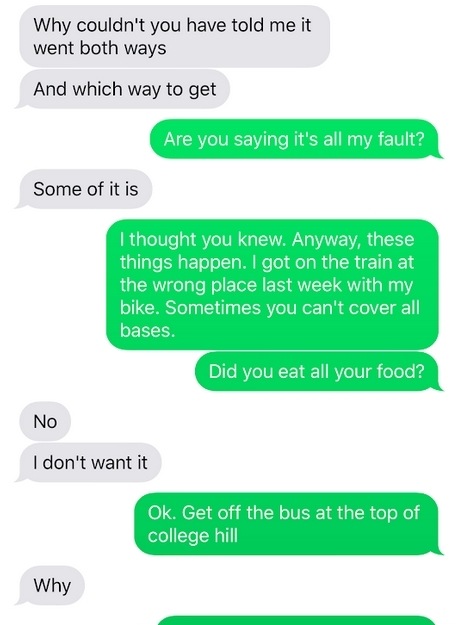 Yes, when I was talking with my friend (the mother of the girl in the text exchange) I mentioned the new network and the 20. Happy ending to the story is that the 20 is now her preferred bus for this weekly trip. It’s a slightly longer walk to get it, but it’s much quicker, and keeps to timetable. My son will be much better off when they can establish the frequent 65 crosstown between Glen Innes and Pt Chev. Currently the only bus that crosses the motorway at Greenlane is the 650 but it isn’t frequent and finishes too early in the evening. As one of several buses that doubles up in part with the Outer Link, once the Outer Link goes, we’ll get the 650 upgraded to frequent 65. Also, going from Pt Chev into town and university on the Outer Link (which was once such a luxury for me) will be vastly improved when it becomes a crosstown route instead: on time and without the multiple waiting stops that add so much time (at Jervois Rd, Victoria Park and Queen St before you get to the university). I’d imagine that will knock off in the order of 10 minutes, and coupled with being able to plan around a proper timetable, is a massive step up. Great post Heidi, and really good points. I’ve gotten on the bus going the wrong way a few times myself! Heidi, the Outer Link is the worst bus service that I have ever ridden with the exception of trying to go from the old Athletic Park in Wellington to Courtenay Place on rugby day when it was quicker to crawl. I use the word service in the loosest sense of the word because from about 4:30pm it transforms, at least in Parnell, from being a service to becoming a lottery. Presumably because of traffic encountered earlier in the route and along Parnell Road, the bus can and does turn up at any old time. It is routes like this that make you think that AT, despite all the pretense to the contrary, cares little about public transport (successful stuff anyway). When I worked in Parnell I would often walk past the bus station to take the train to the city because at least these ran on time and did not become stuck in traffic for indeterminate periods of time. I agree with you Sailor Boy, let’s turn this into a meaningful service that is fit for purpose. This will require a much more determined effort from AT to create bus lanes for the quick movement of buses..
Great article Heidi, my mother found herself in a similar situation recently trying to get to my place in Pt Chev from the city centre. I had told her the bustop and to look for the orange bus but she saw one travelling on the opposite side of the road she thought she had it wrong so quickly crossed and jumped on. 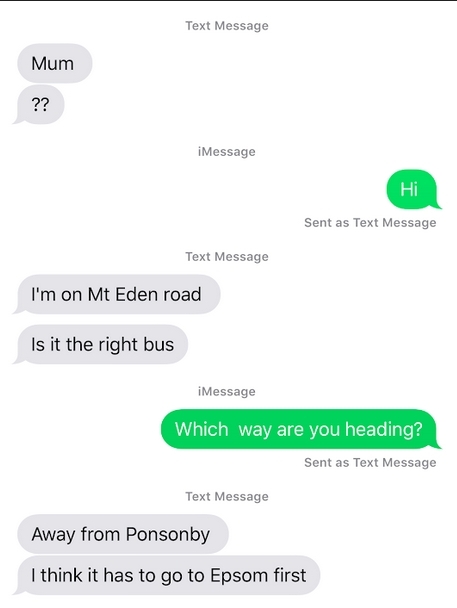 The driver did confirm that she would get to Pt Chev (not mentioning the other direction made better sense). What was meant to be a 15 minute journey took her over an hour and she got quite upset trying to understand where the bus was taking her. It knocked her confidence in using public transport. That’s no good, Kiri. I have heard drivers confirming to people that they’d get to their destination on this bus, failing to add that it’s the long way around, but never when it’s such a poor choice of direction. I hope your Mum has had some better experiences since.